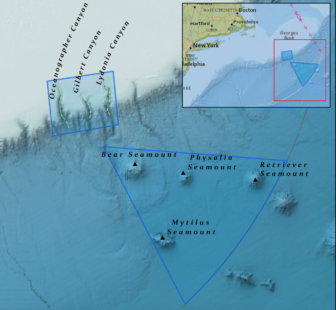 Washington – President Donald Trump’s latest executive order threatens newly won protections for an underwater national monument located 150 miles off the coast of Cape Cod. With a stroke of a pen Wednesday, Trump ordered the Interior Department to review a number of monuments created by former President Obama under the Antiquities Act and identify ones that can be rescinded or resized as part of a push to open up more federal lands to drilling, mining and other development. One of the monuments Obama created is the Northeast Canyons and Seamounts Marine National Monument, also known as the New England Coral Canyons and Seamounts area. It is a massive undersea area where the continental shelf drops off into the deep waters of the Atlantic Ocean, In those deep waters, four extinct underwater volcanoes, called seamounts, provide habitat for a number of cold-water corals that are hundreds, and some thousands, of years old. The ecosystem provides a breeding and feeding ground for a number of fish and other marine animals, including whales. Trump’s executive order is thought to especially target western lands that were put off limits to development by Obama’s creation of about two dozen federally protected national monuments toward the end of his term. The New England Coral Canyons and Seamounts area are part of the Atlantic waters Obama put off limits to new oil and gas leases. Federal protection also bars deep-sea fishing in those waters. “From the Grand Canyon and Stonewall to the Coral Canyons and Seamounts — the first-ever monument in the Atlantic Ocean that I fought for last year— the measures Trump seeks to undo have protected pristine, historically significant sites from harmful activity,” Blumenthal said.